Last Wednesday night at 10pm I was hungry. Very hungry. After running post-work errands all around the city, back and forth on subways, I plopped down on the couch at my friends, watched 20 minutes of The Titanic (I saw the iceberg), I realized the only thing to satisfy my stomach gnawing hunger was a TACO. Carne Asada taco and said I'd be down in 5 minutes. The taco was simple and delicious. As always, the squeeze of lime juice made a huge difference and helped to offset the dry/smokey heat from the hot sauce. The meat was cooked perfectly and the no-nonsense accouterments hit the spot. My hunger was satiated and I was happy. El Diablito, I will return to you. They have a killer brunch menu and for NYC it is very well priced. You say "juice", I say "TACO"
I have been having a serious internal debate. Many people made a resolution to be healthier in 2014. That may include incorporating juice cleanses or veganism or a paleo diet into a daily routine. I am a BIG fan of juices and if you know my Instagram feed you know that I have developed a profound love for Juice Press. I feel great when I do a juice cleanse, but I sometimes question its efficacy. So for 2014 I'm thinking why do a juice cleanse when I can do a TACO CLEANSE. This is just about the best thing I have ever seen. When do I start? Back in Action. 2014. Booya. Not because I wasn't eating tacos. 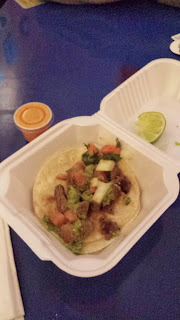 I ate a decent number of tacos and had some fun adventures along the way but I didn't blog about them because I was lazy and didn't really see the benefit. Now it is 2014. I have no idea if anyone spends much time reading this blog, but it's a nice resource to have to chronicle my activities and new experiences. Rather than choose a New Year's resolution, I decided 2014 would be a year to explore. I hope I can share those explorations with you (the reader that is maybe out there).